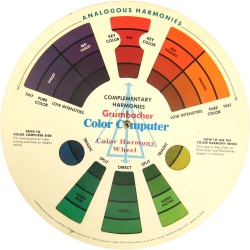 As was mentioned before, the Color Computer can be very useful in color scheme building because it helps us visualize color harmonies. For example, let us say we have a room with lots of red furnishings (red mahogany stained wood furniture, red rug and a brick fireplace.) The walls are painted a light tone of yellow. Color wise, such a room may feel a bit off balance. 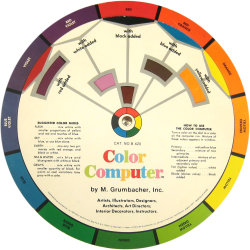 If you look at a side “A” of our Color Computer, you will see that adding a little bit of blue (perhaps a vase or an accent wall) will bring the color balance that you are seeking. This is because blue will nicely fill-in the missing element to a triadic color scheme and will make our color scheme: red, yellow and blue – the most classic triad of them all. © 2010 Yefim Skomorovsky. All Rights Reserved.